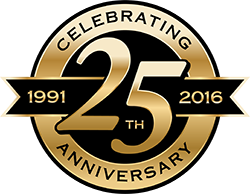 Odors, Line Blockage, High Grease Trap Disposal Fees? The introduction of live bacteria to commercial drain line systems is an ecologically friendly way to combat organic matter problems within drain lines and grease trap systems. They are specifically designed to reduce odor, line blockage, and grease accumulation. Microorganisms are the primary catalyst for the reduction of all waste organic matter from the environment. They are responsible for the biological breakdown and removal of waste organic compounds via an oxidation process where the microorganisms use the organic matter as their energy source, i.e. food. In simple terms, they eat the waste organic matter found in drain lines, grease traps, and effluent waste water and biologically convert it to the basic elements of carbon dioxide and water. The application of biological products to a facilities drain line system will provide a significant reduction in line maintenance cost, and reduce associated line and trap odor. In addition, bio-augmentation may result in a reduction in effluent BOD, COD, and FOG and also provide improvements in the effluent Ph. Facilities using biological treatment in their drain system are likely to provide treatment benefits to their on-site receiving wastewater systems by enhanced degradation performance within the wastewater system. Two treatment methods are used for the introduction of biological products to commercial drain and effluent systems, manually and metered. Both treatment programs will reduce and eliminate odor, maintenance and grease accumulation in traps and drain lines. 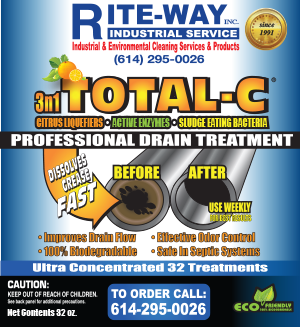 Total C is an all-natural, citrus based product designed to break down grease buildup and other organic compounds within drain lines and grease traps. Total C is composed of Citrus Liquefiers, Active Enzymes, and Bacteria. There are no harsh chemicals, it is completely non-toxic and safe for the environment. Grease and other organic compounds naturally build up in drain lines and grease traps from daily operations. The buildup of grease and organics are the primary reason for drain blockages. When these organics decompose, they begin to emit unpleasant odors. Total C produces a pleasant, fresh citrus scent when used. The bottle is designed to measure out an ounce at a time. It is then mixed with warm water and poured directly into the affected drain. A mechanical meter is installed to dose the product from a 5-gallon pail into the drain line at a timed interval. It is connected to the 3-compartment sink drain line. Call (614) 295-0026 to order yours today!